Mile 347. We are in the Tennessee part of Bristol and it is Thursday morning. The mountains are shrouded in mist, which creates a feeling of enchantment. Just before ten we check out of the Hampton Inn and head downtown to the Birthplace of Country Music Museum. When the early recording industry was taking off in the 1920s, a record producer from New York spent ten days in Bristol recording local musicians playing mountain music. The event became known as the Bristol Sessions of 1927 and was the first time anything like this had ever happened. Dozens local musicians (including Maybelle Carter) and scores of “hillbilly” songs were recorded. Now a Smithsonian museum, which opened just over a year ago, occupies what was once a factory building where you can hear these early recordings and see films and videos of contemporary artists playing and talking about early country music. The museum is fabulous—worth a trip from Washington just to see it and nothing else. But we discover that actually there is much else going on in Bristol and environs, which it turns out is in the middle of a 10-day music festival where dozens of musicians play bluegrass, “Old Timey,” country, and folk music. We lament that we do not have time to see any of this and make a note to come down for the festival in 2017 or soon after. Lunch was in The Eatz, a small and busy mom and pop lunch spot around the corner specializing in home cooked soul food. After we polished off fried cat fish, collard greens, coleslaw and mac and cheese, the owner came over to ask us about how we liked the meal and where we were from. An African American in his fifties, after retiring from the postal service ten years ago, he and his wife started the restaurant catering to the few people who still work downtown and occasional tourists. 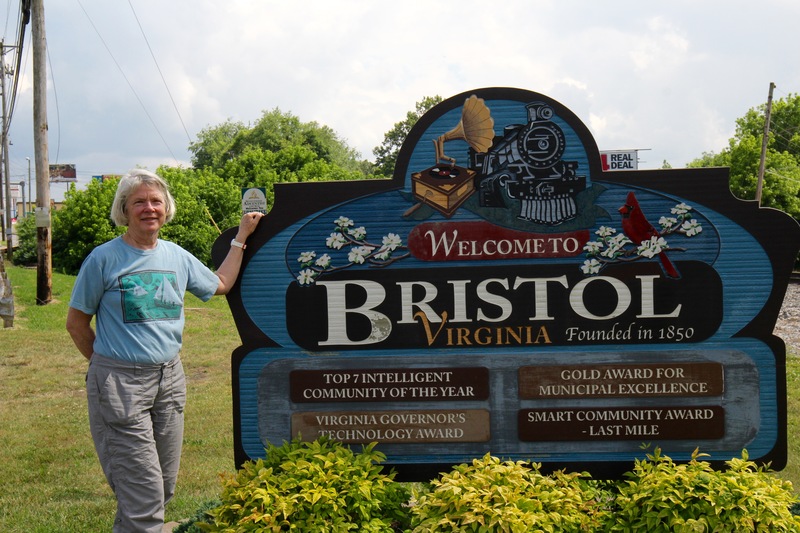 We commented that we were impressed with way that the small downtown area had been preserved and revitalized, to which he responded that actually Bristol was in real trouble—especially the part that is in Virginia (which is a separate town from the Tennessee portion). He complained that the town was continuing to lose population and that his children all settled elsewhere after college since few jobs were available in Bristol. He said this was true of most small towns in the region. The shopping malls and big box stores had sucked the old town centers dry leaving vacant stores and dilapidated buildings. Bristol had at least preserved one street and did enjoy some tourism, but in his view it was a case of too little too late. Listening to him describe a fairly bleak picture, it occurred to me that Bristol could be the poster child for small towns throughout much of rural America. Only remnants remain of what used to be a vital downtown core, now surrounded by several rings, the first an ugly ring of used car lots, junk yards, fast food joints, honky-tonk bars, vacant lots, pawnshops, flea bag motels, auto supply stories and the like. The next ring includes the older neighborhoods with a few big old homes, most here built in the nineteenth century and mostly decaying, and a predominance of smaller, modest, brick houses. The third ring is dominated by the big box stores and national chains located near the interstate intersections. Near them you can find most of the newer and nicer homes. In the case of Bristol, all the homes we saw were very modest. The Eatz owner explained that 18 families controlled 80% of the wealth in Bristol and that for the most part the rest of population was struggling to make ends meet. I checked out some of the demographic facts on the internet: total population for both cities under 50,000 and stable (Tennessee) or shrinking (Virginia). Median income for a family of four in 2010, $37,000 and probably no higher in 2016. Population 95% white. Trump country. How I wonder can a family live comfortably on that amount of money? The answer is that they can’t, and this has got to be a major factor in our summer of discontent. From Bristol we take the shortest route to Asheville, only 85 miles, which we thought might be the most scenic, which it would have been were it not for the motels, chain restaurants, car lots, gas stations, churches (mainly Baptist and Pentecostal) and garish billboards plastering the roadside. Thinking of our Big Trip last summer and the quaint charm of villages throughout Europe and much of Asia, I can’t help concluding that what we have done in this country to sully and demean the natural beauty of our land has got to go down as a national tragedy. It did not have to be this way. We could have done better. Trained as a city planner and having taught planning-related courses at GW and Maryland, I wonder if there is any other profession that can boast of the kind of abject failure that has occurred on our watch. There are bright spots, of course, with concepts like New Urbanism, which promotes compact, high density, mixed use, transit-oriented development , but these sophisticated concepts might just as well be on the moon when it comes to towns and villages losing jobs and population and trying to hang on by a thread. Just as we realized how much we were missing by not being able to take in some of the music festival, we think if only we could have planned to spend a day in the stands of the Bristol Motor Speedway along with 150,000 screaming fans. Then perhaps we would understand the Real America. Still shaking our heads, we spot the exit on to Interstate 25 which will take us the remaining 70 miles to Asheville. This stretch of road—which cuts through a national forest– is what all interstate highways should be like: no advertising or billboards anywhere, only breathtaking views around every curve of the tallest mountains east of the Rockies with many peaks reaching 6,000 feet or higher. PS. Photos to follow when I am able to solve the upload problem. When QuinTango first played in Norton the WalMart had just appeared. The required great expanse of land was available only by mountain top removal. Bye bye mountain, hello WalMart. Yes, it killed mom and pop businesses; yes, locals found it irresistible. We returned some years later only to discover it was abandoned — a whole mountain top sacrificed for a very short run of a WalMart. The empty parking lot was now a hangout for teens. But not to worry – WalMart was building a bigger and better store on a newly de-topped mountain. The Crooked Road is another country music find — put it on your list next time. Thanks Joe – you just gave me great ideas for side trip(s) when I drive to Nashville for a meeting in August! Quite enlightening! Thank you Joe! Yes. This strikes close to home. For Bristol was home. When I was ten years old I and my friends were downtown almost every day, at the Y or church or movies (at the Cameo and Paramount Theaters) or shooting pinball at Ralph’s on the corner of State Street and Pennsylvania. The train station was the center of the city. There were two different “states” but life was porous and there were no boundaries restricting our movement so we felt free to go anywhere. We picked up games at the V.I. (Virginia Intermont College) gym with kids our age who lived on the Virginia side, whom we never saw except there. The trains were always running and they ran straight through the heart of town and on south to New Orleans or north to NYC or Boston. Every day we walked under a splendid and towering sign which soared above, and spanned, State Street in the shape of an arch, with many lights – light bulbs – connecting the two sides – and states – of the city, and (subconsciously I think, to the child I was, o f that same child, and his city – and his country, too). I feel a deep sadness for what has happened to “Bristol, Tennessee Virginia, a good place to live” (as the sign assured us, when we were ten) and to the towns, small & large, of our country, and increasingly – in this year of trumpery & madness – to the country itself, great as I believe it still is. I remember your vivid descriptions last year of the towns of Asia, with their countless millions, their rapid trains each one on schedule and spotless stations packed with well-informed travelers: of the sun rising on their countries. As the light darkens in the West. Though no one seems to notice – or care much. Thank you for your insights and soundings. We badly need them. No one is speaking of these things so honestly, with such eloquence and urgency. Keep writing. I’m hooked. Didn’t know any of what you saw and heard in Bristol. We just pass thru on I – 81 on our way to DC or surrounds. Cajun grill and a quick tour of Cookeville- a prosperous 30-35,000 town we have loved for the last 30 years. We”ll be at church till 12 unless you call earlier and then I’ll bail out and meet you. Bristol’s down-turn is typical of many towns and cities in the western world. Here (Southport, UK) we have what was once said to be one of the three most elegant streets in the UK – Lord Street. There’s still some elegance, but too many empty shops suggest it, too, is on the downward slope. And people like me are to blame – books from Amazon, delivered next day, shopping at the out of town supermarket. It is a seemingly unstoppable trend. How do these communities discover a new rationale that is more than coffee shops?